The air is crisp, the novelty of school is wearing thin, and your best intentions to provide healthy food for your family is wavering under the time demands of after school activities. We understand, but have no fear…the Local Food Club is here! Starting in October, select schools in the Headwaters Region will have the opportunity to join HFFA’s Local Food Club. Once a month, food club members receive a bag of locally sourced, nutritious food that makes a family sized meal. We source seasonal recipes from local community members, farmers, and business owners. The chosen monthly recipe is vetted by local dietitians and the ingredients are sourced from local farms. Recipe ingredients and instructions are packaged in our trendy bright orange backpack and brought home by students on the last Wednesday of the month. Voila! Dinner in a bag. There are tips on how to get your children involved in food preparation and how to contact the farmers that provided the amazing bounty in your bag. Sometimes we can’t offer all recipe ingredients because of food safety rules but we will email you in advance listing anything you need to complete the recipe. This program met with rave reviews last year, and we have a list of schools on our waiting list, eager to participate as soon as we build the capacity to expand. We are looking forward to offering it again this year and adding more schools, but we are seeking additional funding, cold storage, volunteers and drivers/trucks in order to do so. If you have any of these resources or connections that might help, if you are interested in getting your school involved, if you would like to donate or help fundraise for this excellent program, we would love to hear from you! Got questions? 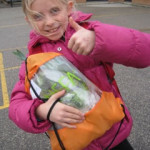 Visit the Farm to School site and check out our Frequently Asked Questions.